Test Devices Inc Facility Archives | Test Devices Inc.
2018 has been a banner year for Test Devices, with expansions in both our facilities and our services, allowing us to better serve our customers as a “dependable partner” and a convenient “one stop shop”. Some of our new and expanded service offerings include in-house machining, eDrive spin testing, and expanded balancing capabilities – thanks to the acquisition of a new Schenck balancing machine. Test Devices’ latest facility upgrade brought significant improvements to our shipping and receiving departments and upgrades to our climate-controlled precision inspection room, which includes the expansion of our Quality Inspection team and the acquisition of a new larger CMM (coordinate measuring machine). The redesigned facility layout, added floor space, and new equipment allowed us to streamline our workflow and enables us to work more efficiently than ever before. The new shipping and receiving departments are now located to the front of the building with an expanded floor space, and optimally equipped handling areas with additional cranes and staged operations. This new layout minimizes unnecessary movement, creates easier access and an unobstructed flow of materials. We have also expanded our equipment build area and relocated it to a new section of our facility. This move allowed for a more efficient staging of equipment builds and assembly operations capable of preparing three to four machines simultaneously. As of June, Test Devices now offers in-house semi-finish machining services for aerospace turbine disks. For over a decade, TDI has served leading jet engine OEMs who require forging pre-spinning services—a vital part of producing nascent engine disks that offer the highest performance. While a seemingly simple process, this service is deeply specialized, demanding the highest knowledge and skill level to produce a seamless operation. This newly added machining capability will vertically integrate operational steps and allow TDI to offer more expeditious and higher quality services. By the end of 2018, TDI is on track to ship over 100 semi-finished forgings. In 2018, Test Devices grew our balancing capabilities by acquiring a new HM 20 Schenck Horizontal Balancing Machine to support the growing demand for these operations. This high precision, state-of-the-art machine allows TDI to service a broader range of customers with varying rotor balancing needs. Among the primary benefits of the HM 20 is its hard-mounted bearing design, ensuring rapid changeovers between rotors, which allows Test Devices handle significantly higher volumes of balancing jobs and increase the efficiency of our operational capabilities. The HM 20’s modular design also allows it to be easily modified. The successful completion of an increasing number of proof and burst tests and 130,000 LCF cycles in 2018 attests to the growing demand for eDrive testing. We are continuing to enhance our testing and engineering offerings to support eDrive customers in 2018, including advanced rotor growth mapping, high-resolution, high-speed video imaging, expedited fatigue, LCF tests (with RT-CDS and growth mapping), heated spin tests, unbalance budgeting and rotor design engineering support. Test Devices Inc. continues to build our services and capabilities in 2019 and we look forward to offering better services for new and existing clients in the aerospace, automotive, and other highly technical industries. We will keep leading the industry by offering the latest services and technology. To learn how our spin testing, balancing, and other services can help your R&D efforts, prototyping, or manufacturing operation, contact us or request a quote. Test Devices Inc. (TDI) is thrilled to announce that we’ll be offering in-house rough machining services starting June 2018. As a part of our investment in expanding this capability, we’ll be adding two horizontal CNC horizontal lathes (Okuma), allowing TDI to become a convenient one-stop shop. Our team can now serve clients throughout every step of the process, from design to pilot run to full process deployment, all with AS9100/ISO9001 Rev D compliance. For over 10 years, TDI has been serving leading jet engine OEMs with forging pre-spinning services, an essential step for nascent high-performance engine disk production. Adding the rough machining capability onsite now allows us to offer shorter turnaround times and higher overall efficiency, ensuring clients’ specific needs are met as smoothly and quickly as possible. The demand for aircraft continues to grow, supporting the need for increased air travel. This trend is expected to continue its upward trajectory over the next 15 to 20 years; translating to continued growth in aircraft and engine sales from lead OEMs — as well as an increased need for critical spare parts that require pre-spin and rough machining. Engine turbine disks, for instance, must undergo these processes to ensure optimal performance and safety. By bringing rough machining in-house, TDI will reduce both costs and turnaround times for our customers, and overall flexibility and responsiveness will be significantly improved. We are well-positioned to meet the rising demand. We aim to serve as a truly dependable, knowledgeable partner, serving every customer’s most challenging mechanical equipment needs. To learn more about TDI and explore our specialty services and pre-spin testing capabilities, download our free eBook, “Spin Testing for Manufacturing 101,” or reach out to the team today. As the rate of jet engine part production has rapidly increased and our clients continue to forecast further growth, we’ve become a trusted spin testing & spin process provider. To keep up with rising demand and continue to offer the most cutting-edge services available, Test Devices, Inc. has completed multiple facility expansions in recent years. So, what’s new at Test Devices, and what do our latest expansions mean for our customers? Our latest expansion incorporates improvements in both the shipping and receiving department and the equipment build area. 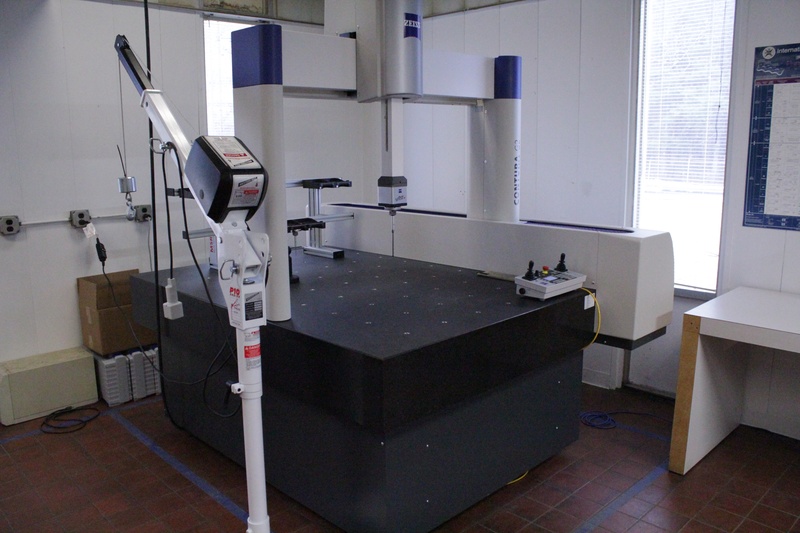 We’ve also recently acquired a new coordinate measuring machine (CMM)! Shipping and receiving — To re-engineer the flow of parts coming into and out of our building, we relocated the shipping and receiving department to the front of the building to allow for expanded storage and handling areas along with additional cranes. In addition, the new area includes both plenty of space for trucks to back-in and an adjustable loading dock, allowing our forklifts to directly unload trailers. The relocation and improvements make unloading and loading operations significantly more efficient, contributing to reductions in turn-around time of customer parts. New coordinate measuring machine — To support the needs of our growing forging pre-spin business, we remodeled our climate-controlled precision inspection room, expanded the Quality Inspection team, and added a new larger Zeiss CMM machine. Equipment build area — Because of the volume of recent spin rig orders, the equipment build & assembly area was relocated to a new section of the building. This update allows for new capabilities including improved setup and staging of the equipment builds and the ability to build three to four machines simultaneously. The improved build area also features an updated air supply and electrical supply for building and testing advanced machines. With an eye on quality services and constant innovation across everything we do, our Test Devices, Inc. team consistently strives to provide timely and efficient services to better meet our customers’ needs. An industry-leading provider of spin testing and balancing services, Test Devices is thrilled to announce these new facility updates, which will allow us to better serve our ever-expanding client base. For more information on these changes, or to discuss how we can help with your specific testing needs, contact the team today. We’re on hand to answer any questions you may have. [Deer Park, New York. and Hudson, Mass.] Sept. 28, 2017 – Schenck Corporation (Schenck) and Test Devices, Inc. (TDI) announced today that they have reached a definitive agreement under which Schenck will acquire TDI in the form of a share deal from its current owner, Mr. H. Eric Sonnichsen. TDI is a leader in aviation-related testing technologies in the commercial and military sector, and is globally recognized for its proprietary, high-speed testing solutions. The company generated sales greater than $8 million in 2016. Schenck is an affiliated company of Germany-based Schenck RoTec GmbH. They are a leader in balancing and vibration diagnostic devices, with regional US offices in Detroit, MI, Chicago, IL, Houston, TX, Greenville, SC and Anaheim, CA. In addition, Schenck has a Mexican subsidiary with service cells in five main industrial areas. Its North American sales are about $50 million (globally around $250 million). “We are excited to become part of the Schenck and Dürr organization, which will enable TDI to deliver significantly more value to customers. We look forward to further innovating in the domain of high-speed testing services and equipment, benefiting our customers by providing increased capability, and further assisting them in their ongoing efforts to advance their products” said Test Devices’ President David Woodford. Upon completion of the transaction, Schenck and TDI will continue their present product offerings, as two complementary brands with David Woodford retaining his position as President of TDI and Ulrik Frodermann, President of Schenck acting as the chairman of the supervisory board. Mr. Sonnichsen will continue to support the business as a Senior Engineering Consultant. Schenck Corporation, Deer Park NY, a fully owned subsidiary of Schenck RoTec GmbH based in Darmstadt, Germany, provides high technology products and services to automotive and aerospace industries. Schenck RoTec is the world market leader in the field of balancing and diagnosis technology and has 17 subsidiaries and joint ventures with seven production sites worldwide. In addition, there are 44 representatives and offices on all five continents. The Schenck RoTec group supplies innovative technologies to important industries such as the automotive and supply industries, the electrical and electronics industry, aerospace, power station engineering and mechanical engineering. This publication has been prepared independently by Schenck Corporation. It may contain statements which address such key issues as strategy, future financial results, events, competitive positions and product developments. Such forward-looking statements are subject to a number of risks, uncertainties and other factors, including, but not limited to those described in Dürr’s disclosures, in particular in the chapter entitled “Risks” in Dürr’s annual report. Should one or more of these risks, uncertainties and other factors materialize, or should underlying expectations not occur or assumptions prove incorrect, actual results, performances or achievements of Dürr may vary materially from those described in the relevant forward-looking statements. These statements may be identified by words such as “expect,” “want,” “anticipate,” “intend,” “plan,” “believe,” “seek,” “estimate,” “will,” “project” or words of similar meaning. Dürr neither intends, nor assumes any obligation, to update or revise its forward-looking statements regularly in light of developments which differ from those anticipated. Stated competitive positions are based on management estimates supported by information provided by specialized external agencies. Over the last year, Test Devices has seen a significant influx in the volume of parts that our facility processes on a weekly basis. This increased demand pushed us to re-evaluate whether our methods were providing the best possible experience for our clients. Many of the parts we process require that a precise measurement be taken both before and after the spin test. In January 2017, we installed a 2nd CMM (scans parts up to 48” diameter) that not only allows us to inspect larger parts, but to inspect multiple parts simultaneously as well. In 2016, we dedicated (2) spin rigs to be used solely for the support of pre-spin and overspeed spin testing. We are also retrofitting another existing machine (available mid-April). With the addition of this machine, we will have a total of (3) machines dedicated to our pre-spin and overspeed spin testing, and Test Devices will be able to better dedicate rigs for specific speeds and part types – ultimately significantly reducing setup times. Test Devices has added additional personnel to support two shifts of operation in both spin rigs and CMM inspection. We are actively looking for additional candidates as the 3rd spin rig comes on-line. Last year, Test Devices acquired additional space within our facility, and we immediately went to work to determine how it could be used to maximize efficiency and improve part flow. A thoughtful reorganization of our layout freed up a significant amount of room, which is now expressly dedicated to handling the increased volume of pre-spin and overspeed spin testing. 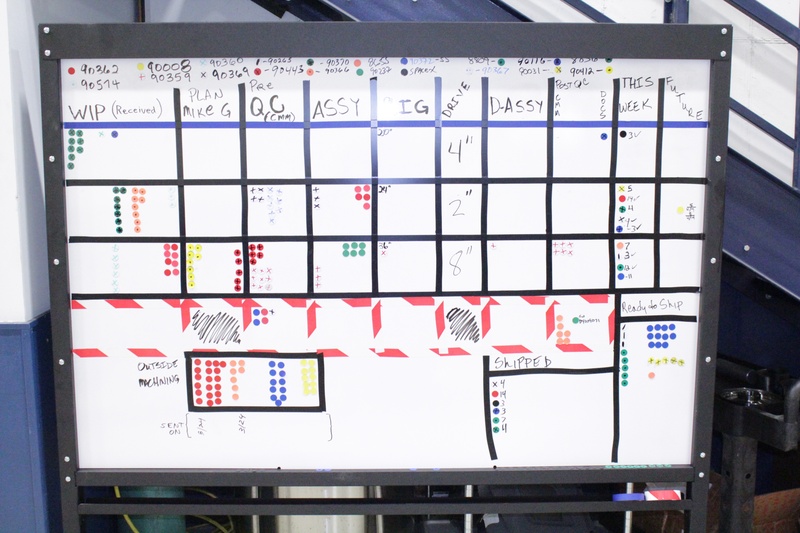 We have recently instituted the use of a whiteboard to improve scheduling and better ensure we meet customer commitments.